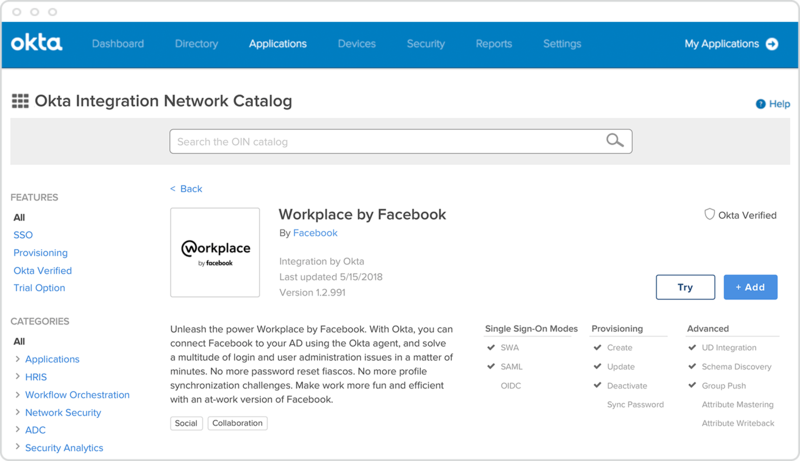 Project Onramp puts your app in front of target customers, where they can try, setup and deploy it right from the Okta Integration Network catalogue. Qualified prospects - Okta customers already use thousands of cloud apps, making them great candidates for new tech. Clear decision maker - No more single-person trials from Joe user; you’ll get the primary contact for the trial from IT during setup. Accelerated provisioning - With Okta, IT can easily assign the right users and groups (or even the entire company) to an app in just a few clicks. Pre-built Active Directory integration - Okta bridges the gap between our customers’ on-prem directories and the cloud, eliminating a multitude of login and provisioning hassles for your app. Seamless activation - Users can log in with their existing Okta credentials to an account with a rich, pre-populated profile sourced from Okta’s Universal Directory. Self-serve account expansion - IT can add more users to the app right from the Okta admin dashboard. Sell a business app? Request early access to Project Onramp. Contact us to receive program updates and get questions answered.